« What’s Going On ? Have you ever noticed folks who are stacked with cash get away with some goofy stuff ? This is not to say they are breaking the law or robbing a bank, but when the lime light hits them just right, you sometimes get statements that make you scratch your head. 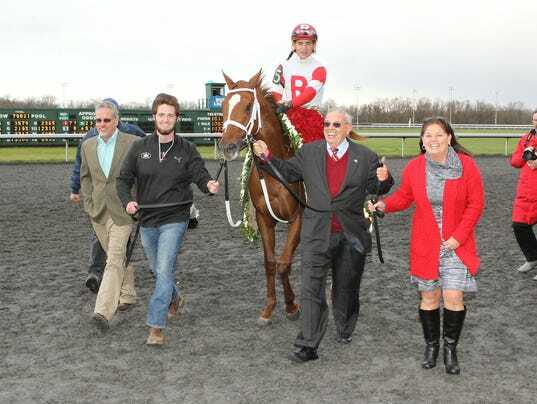 This past Saturday at Turfway Park I experienced a situation of sorts. – There I stood in the press box with some of the best scribes that cover horse racing and we were all riveted to the in-house television coverage. The big race had just been completed, and in a room filled with some of the great racing minds you could have heard a pin drop. Oscar Nominated had just won the $500,000 Horseshoe Spiral Stakes at Turfway Park at odds of 23-1. – Brian Hernandez Jr. picked up the mount as Robby Albarado was unavailable. Nice days pay for a pick up mount to say the least, but the action was not winning by a neck in the shadow of the wire, but the focus was on outspoken leading owner Ken Ramsey. – The colt was not nominated to the Kentucky Derby and Mr. Ramsey was interviewed after the race and had some pearls of wisdom to share with every horse player and want-to-be owner in ear shot. ” If you would like to put up half of the $200,000 entry fee, you will receive half of his earnings through the Triple Crown.” – The press box was silent as the writers started reaching into their pockets to finds that $100,000 needed to be a part of the action. But after all monies were added, they had enough to buy a few beers and chuckle about the offer. A graduate of the University of Kentucky by way of the GI Bill, Ramsey was a trucking industry executive before turning to real estate in the 1970s and then to cellular telephone network franchising in the 1980s, primarily along Interstate 75 in northeastern Georgia and southeastern Kentucky. He sold the cellular business, valued at $39 million, in 1994 and bought historic Almahurst Farm near Lexington, renaming it Ramsey Farm according to America’s Best Racing. – Mr. Ramsey was a self made man. He is filled with family pride and a smile that can be seen from the moon when he leads his runners into the winner’s circle. I love the way he always has his wife and partner Sarah by his side, and tends to her by wheeling her chair into the winner’s circle more times than I can count. – He is grounded and knows what he wants. – I had the opportunity to interview him for a radio show and asked him if he ever envisioned a young man from Artemus, Kentucky being a major player in the Thoroughbred industry. – ” Well, young man it is not Artemus, it is pronounced Ar-Tee-Mus, Kentucky.” – From that point on I liked hearing what Mr. Ramsey had to say.